Inkin' It Up With Kendra! : Day 3 - Kraftin' Kimmie July Sneak Peek & Release! Day 3 - Kraftin' Kimmie July Sneak Peek & Release! Welcome back to day THREE of our JULY Kraftin' Kimmie Peeks!!! Aren't they fabulous?!! We are SO thrilled to share the newest set of THREE images with matching sentiments from CHERYL! 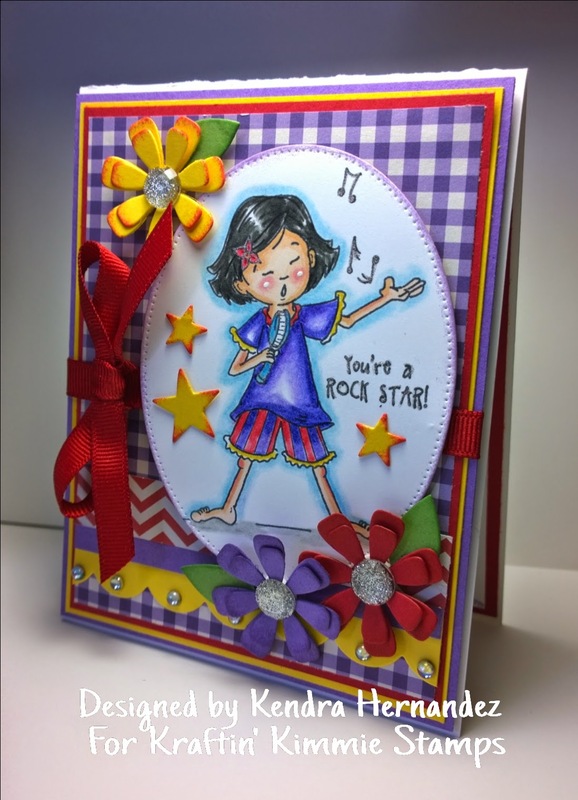 This musical new set will make your heart SING and it is called YOU'RE A ROCKSTAR!! This week our challenge hostess is SHERI! And her challenge is ANYTHING GOES!! So create a card, scrapbook page or altered item with any stamp but if you use a Kraftin' Kimmie stamp you'll double your chances to WIN!! Use any sketch, any design, any embellishments because Anything Goes! Have some krafty fun and join us this week because we'd LOVE to see your KKS designs. We hope you can play along for your a chance to WIN a $10 Gift Certificate to use on ANYTHING you want in the shop!! Wanna win?? Hope you can join us for all the fun and excitement and prizes and it's all happening TONIGHT!!! We'll be releasing all the new stamps you've seen this week beginning at 6pm EDT at our LIVE ONLINE RELEASE PARTY!! Hope you can join us!! Here's my Sneak Peek Design using You're a Rockstar!! This image so reminds me of my sister when she was little - looks kinda like she did too :) Love this image and I'm really loving the pop of the purple! So come and hang out with us for all the LIVE action krafty fun at the party and then come on back here tomorrow to check out the release day blog hop! 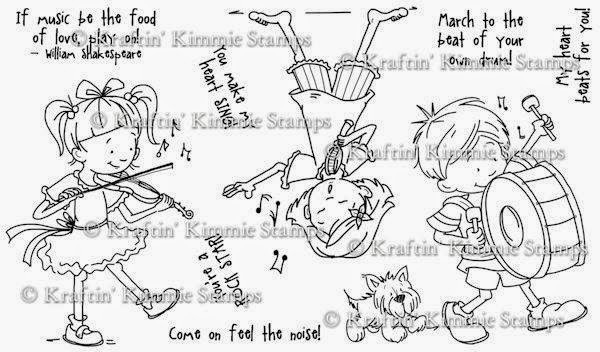 ALL the new stamps will be available TONIGHT at the KKStamps Shop!! 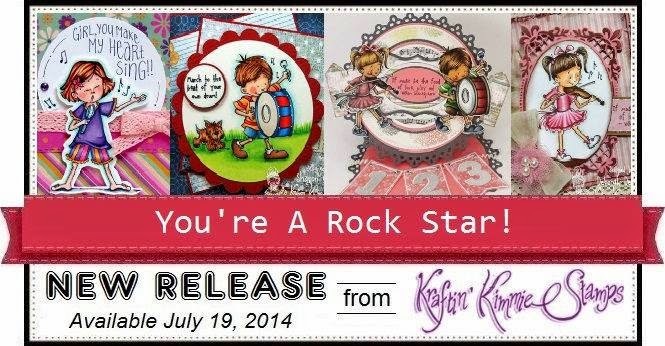 Stamps: Kraftin Kimmie Stamps You're a Rock Star! Oh sooo cute Kendra. Love the new image and your colours and colouring are just FAB !! Thanks for sharing. Lovely card and great fit of the image with the design papers. You just used the perfect colors. Thanks! this card makes me smile!!! Love the bright colors and the flower accents. Cute card Kendra! I love the layout you made too! I love these fun, vibrant colors! Love the colors in the background and the flowers. such a pretty card. Oh wow ! The coloring is amazing ! Love your card ! Beautiful!! She really is a little cutie! Love your layout and the color combo is so fun! Adorable card, love the colours you've used. This is over the top gorgeous Kendra. Your coloring is fantastic. I love the colors on this card. Very pretty.